As data continues to rapidly grow, so do expectations on how to analyze it faster. Organizations are faced with three options these days. Consider other ways to manage your data. The first option is very expensive, and the third could put you out of business. But how much do you really know about option two? This white paper is designed to be a visual playbook for the non-geek, yet technically savvy, business professional who is looking for low-cost, high-speed data processing to complement their current Enterprise Data Warehouse (EDW). 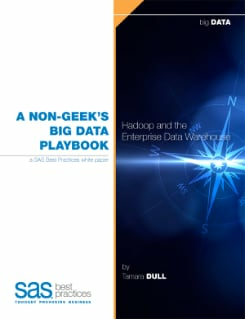 Specifically, this Big Data Playbook demonstrates in six common "plays" how Apache Hadoop, the open source poster child for big data technologies, can support and extend the EDW ecosystem.